Celebrate Day of the Dead, feast and altar-making, Friday, November 2, 4 – 7 pm, FREE! Dia de los Muertos is an enduring tradition to remember loved ones. It originated in Mesoamerica as a blend of Spanish, Aztec, and ancient traditions. Today, it is celebrated worldwide. 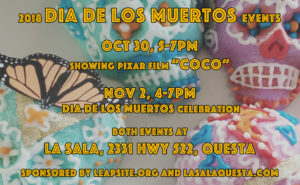 LEAP and La Sala will host the 4th annual celebration in Questa. LEAP is Land, Experience and Art of Place, an artist-run organization that creates arts and educational events and opportunities reflecting the natural and cultural ecology of Questa and surrounding communities. La Sala is a space in Questa, growing to serve as a home for movements, like yoga, plus music and more! 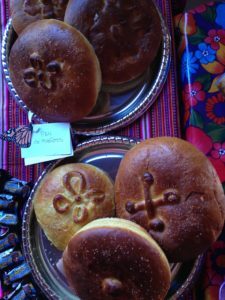 Celebrate Dia de los Muertos on November 2, 4-7 pm with music, art making and a feast: posole, prune pies, hot chocolate, pan de muerto, and more! Bring a dish to share, perhaps a favorite of someone being remembered. Participants can bring photos of loved ones or objects to add to a community altar. The Questa Stories Project will be present and available to record community members’ remembrances of loved-ones, if families choose to share (QuestaStories.org). There will be much to do and feast upon, and music to enjoy. A key aspect of the evening will be art making and sharing in a supportive and festive environment. Participants can make sugar skulls, paper marigolds, and other art; supplies and instruction are provided. The essence of Dia de los Muertos is to honor loved ones with celebration and meaningful actions. This ritual offers a container for feelings of sorrow at the death of our beloveds. And by treating the eventuality with honesty and even humor, we recognize we are all sojourners; some are simply further ahead. There are few set parameters, besides food, music, bright colors, and active remembering; this may explain why Day of the Dead has spread across the world. This collaborative event is coordinated by Gaea McGahee (LaSalaQuesta.com) and Claire Coté (LeapSite.org) with help from Dava McGahee (DavaCulturalLegacy.com), and many from Questa and surrounding communities. For more information contact us or call (575) 224-2102. Wow – this sounds like a lot of fun. I will try to bring my family up from Taos! At the south end of Questa.